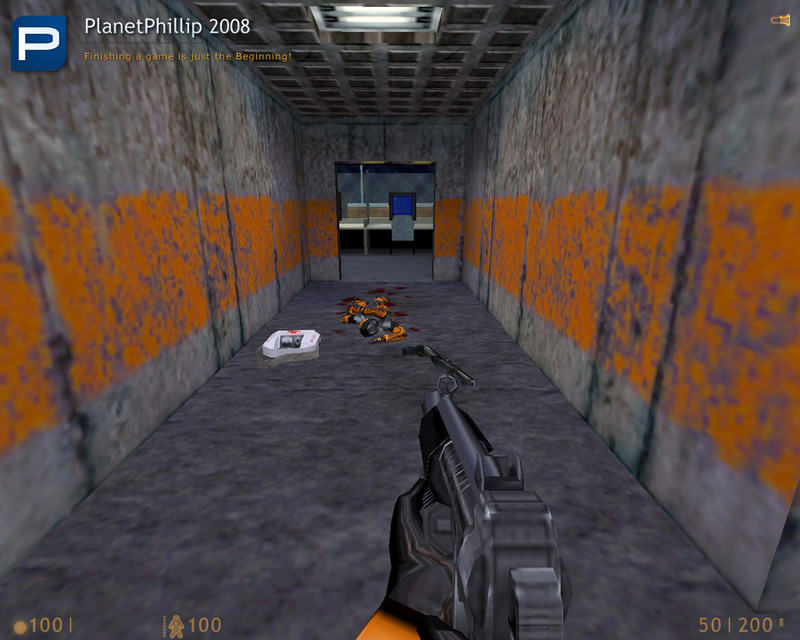 Copy the nova folder into your Half-Life folder. Operation: Nova should now be listed in your Library tab. I haven’t played any Half-Life 1 mods for quite a long time, so this was part new mod and part reacquainting myself with the HL1 mechanics. There’s no doubt that this is a very good release but I had a bit of trouble with the levels transitions and even the odd HOM. I don’t have the patience to just keep killing the soldiers and I culdn’t fgiure out what else I was supposed to do. It’s hard to get too enthusiastic over such a release becasue the game is ten years old and we get to point where everything merges into one mod. 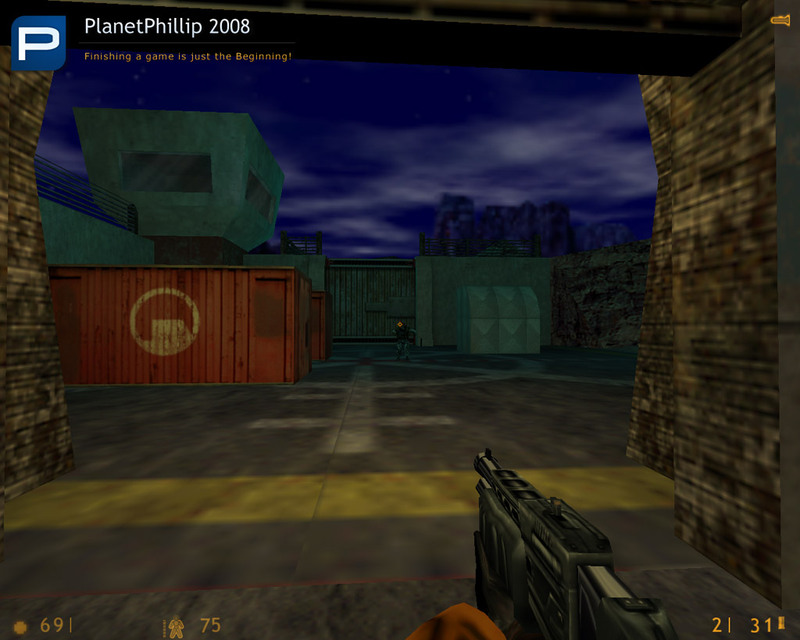 I think I’m too tired of HL1 to give it a Play It Now! recommendation. That said it’s very good and definitely worth your time. I just found a major bug in this mod. I sorta figured I had to get this scientist to press a button to enable a lift I just found to to go down but he refuses to go into the building even with prodding to get him to go in. I had to prod hgim into going down the stairs. Which part are you referring to? As far as I’m aware there isn’t a part where you need to get a scientist to go down some stairs, and then get a lift to go down. Can you post a screenshot of the part you mean? I just realized I wasn’t SUPPOSED to get over there because I CHEATED, but now I’m going the RIGHT way. Now I’m stuck again I got the scientist to open up the elevator gets electricuted and got 30 secs and I had to use the barnacles in the elevator shaft for something. I’m stuck at the same place. Up the barnacle, no leverage to swing into the high window/doorway. Go thud on distant floor below. Lather, rinse, repeat. After a couple of hours I just realized the solution Andrew. You let one of the barnacles get you and when when you get to the opening you shoot the button behind the glass and this activates the lift then shoot the barnacle that has you and when you fall the lift will be at the opening to cushion your tiny fall. And thanks for telling me that Andrew. I’m now going to read it. Yup Yup Yup. Nostalgia isn’t what it used to be … or something like that. 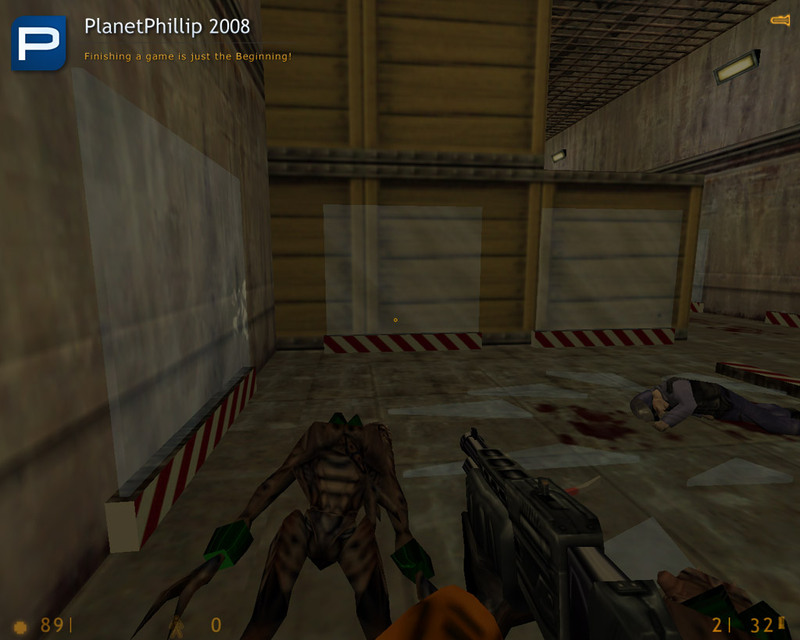 I’d even forgotten what an HL1 headcrab looked like. Not to mention how to fool the HL1 vorts. But it all comes back and it’s a deal of fun. The backtracking is controversial for some no doubt. 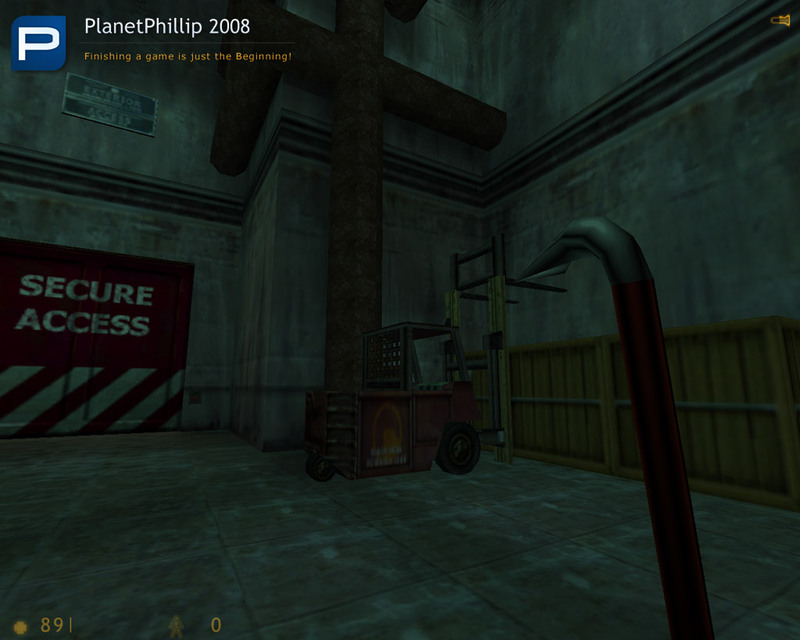 On the other hand, the lightning fast map loads are something I wish HL2 had going for it. Nice blast from the past!! Thanks for playing guys. And thanks for the rating, Andrew. Sorry it took so long to work out that puzzle, Marc. I hope it was satisfying when you did. The thing is, I really wanted to do something different with this mod, with regards the gameplay. FPS gameplay is always the same, shoot, get someone to open a door, press a button, etc., so I wanted to add in some variety with the puzzles. Ben, a question, when you are in the arena area, with the chopper overhead, the inactive big gun and the big door with no switch, How do you get Barney to open the door?? I had to “clip” thru it to continue, and that’s what I don’t like to do!! Other than that it was an enjoyable romp, Thanks! 🙂 I also enjoy the oldies feel and am currently playing all my DukeNukem games!! Okay, I’m surprised other readers haven’t commented on this mod yet. Anyway, thanks to Ben for helping me with the machine gun I have now finished the mod. I enjoyed it and commend the author for making a tight, well balanced mod. I do however have a couple of gripes. The first is the elevator and barnacles. I feel that is was a design flaw to only give the player 20 seconds to figure out what to do but also only give them one chance. At no point have I, as a player, been promed by this mod to use the barnacles as ways of getting up. Yes, perhaps in other mods but my first assumption was that I could get “Picked up” by the barnacle and then kill it just before I reached the top and then swing across. The next gripe is with the jump from the broken ladder to the detonator. I found it really difficult and simply died a number of time. Again, killing the player because of a simply error like this I believe is counter productive. I have often stopped playing mods for exactly the same reason. Why not put some water at the bottom of the shaft that drops the health points by 10 but still allows me to try again. By killing the player I have nothing to lose if I miss because I can simply do it again. IF on the other hand I lose helath points each time I miss then I may feel a little apprehensive. You coulkd counter by saying that a player could quick save just before jumping and quick loading if they miss. This is true but you can’t control those types of players anyway. I found shooting the troop drop and little boring and felt that even though the door was destroyed it somehow became fixed again later in the levels. One of the assassins took about 10 point blank shotgun shots to die, but I presume that was a bug. 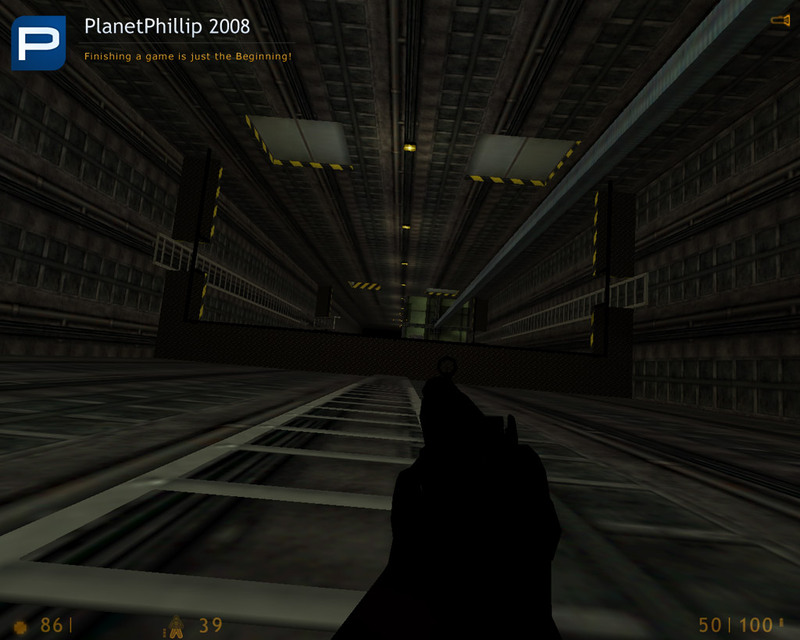 Even though I gave it a Play It LAter recommendation, that’s more becasue of feeling jaded with HL1 itself than the mod. Anybody reading this who still loves HL1, should play it. 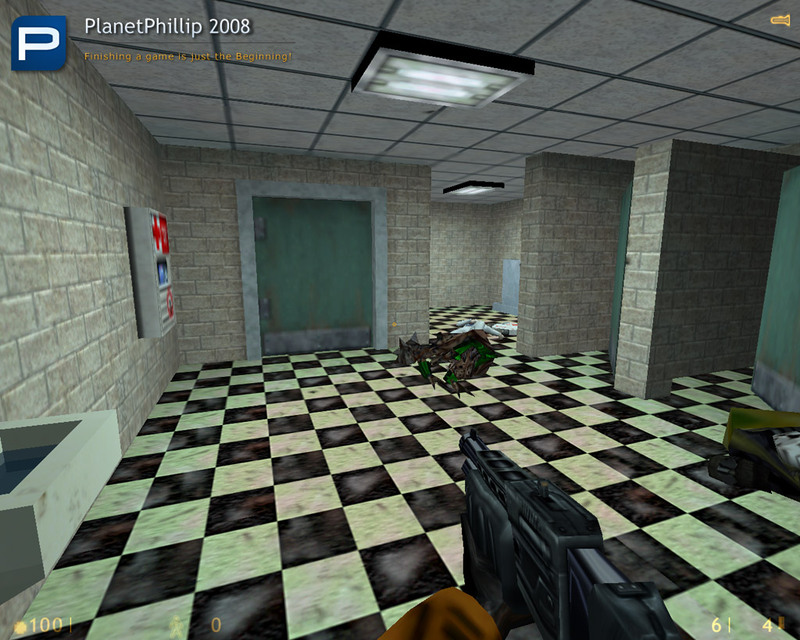 Half-Life was released in November 19th, 1998. 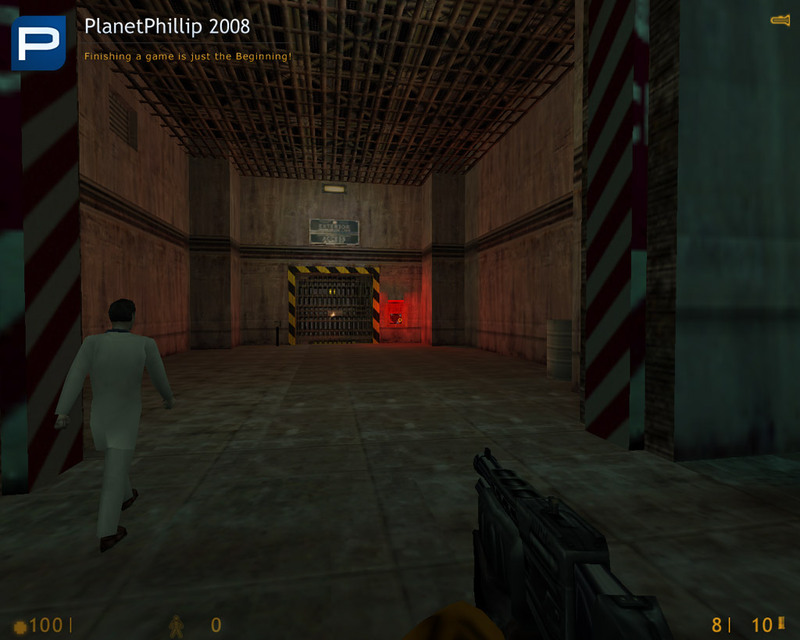 In two months from now, Half-Life will be celebrating it’s tenth anniversary as a released video game. So, I think I’m justified when my first words regarding Operation Nova is “Christ, people still make these?”. 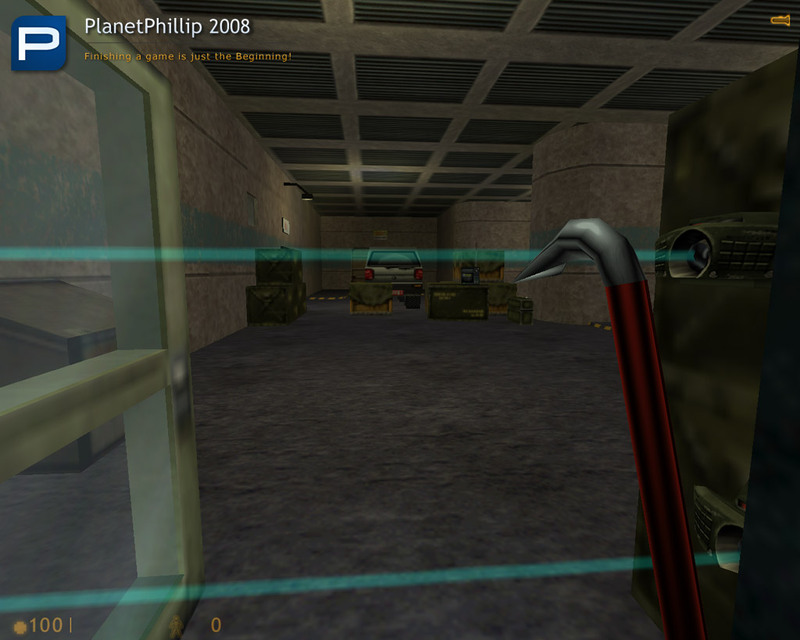 Operation Nova is in a long line of modifications that take place in Black Mesa, presumably in order to avoid making their own textures, specifically operating as a side story to Gordon Freeman’s satellite-launching endeavor during the “On A Rail” chapter. 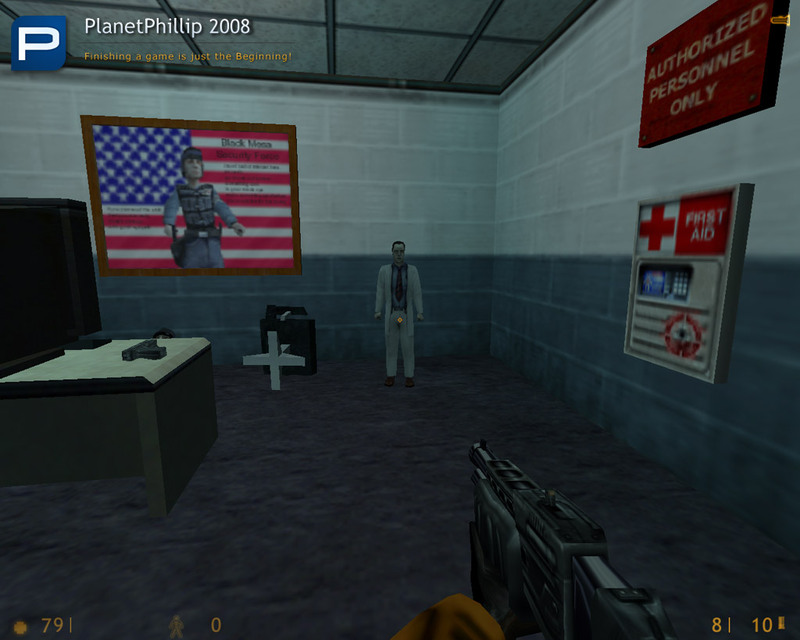 You play John Skinner, the one of many HEV-suited inexplicitly-skilled-in-firearms janitors that frequent Black Mesa, and you start the game off on a toilet. Before I dive into my usual hatred and negativity, lets express whats good about this modification. 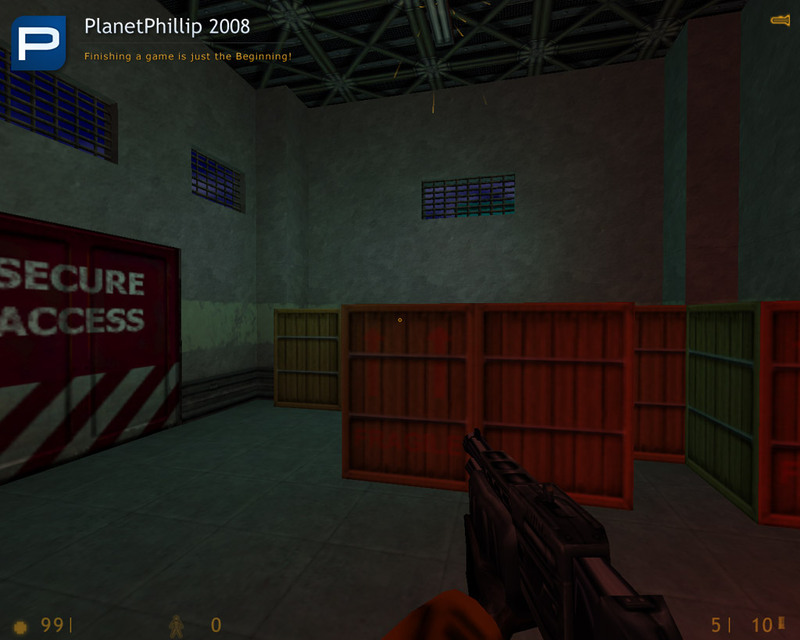 The level design, though bland and seen before so many times, ranges from functional to comfortable with the offices getting a particular mention as being the highlight of this mod’s level design. The puzzles are creative and quite fun to solve. 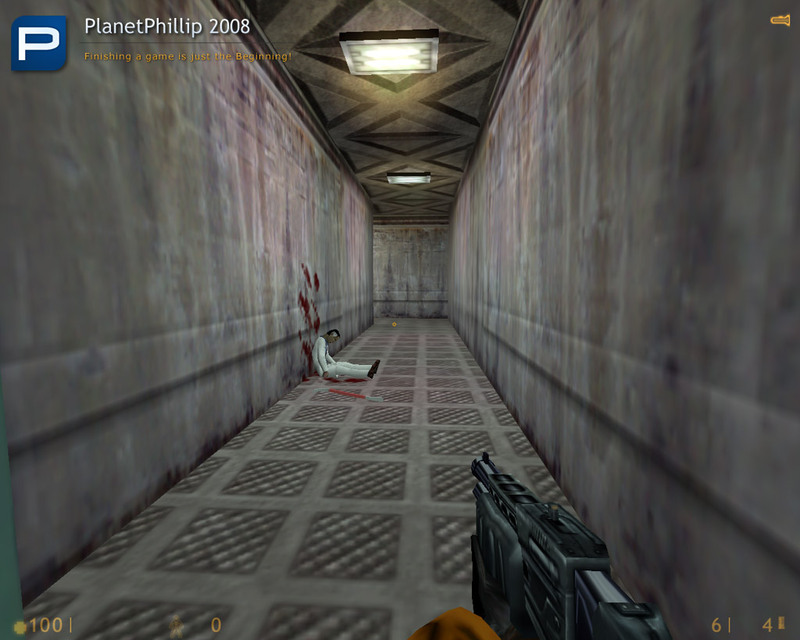 The difficulty is nicely leveled though it may prove too easy for the more insane veterans of Half-Life and placement of weapons and enemies leaves little to be upset about. A particular note should be said for the modification’s touted “experianced voice acting’. Indeed, play the modification and you’ll hear voice acting that outshines a good deal of modifications. However, the voice acting is constrained by a bad dialogue writer and an unnecessary adoption of the stereotypical posh-voiced British scientist and the angry American security guard which will leave a bad taste for most people. The dialogue of the scientists specifically left me questioning whether these British scientists were developed as a way of poking fun at the stereotype in general like Mike & Pete’s Half-Life Sound Pack. As badly written as it is, the dialogue is more then functional for providing movement to the plot and steering our John Skinner here into effective locations of which he can stretch his murderous impulses. Also, this mod is short. Real short. I completed it in about twenty minutes. In summary, it’s okay. It does nothing out of the ordinary besides it’s voice acting, of which I really can’t recommend the modification for that. 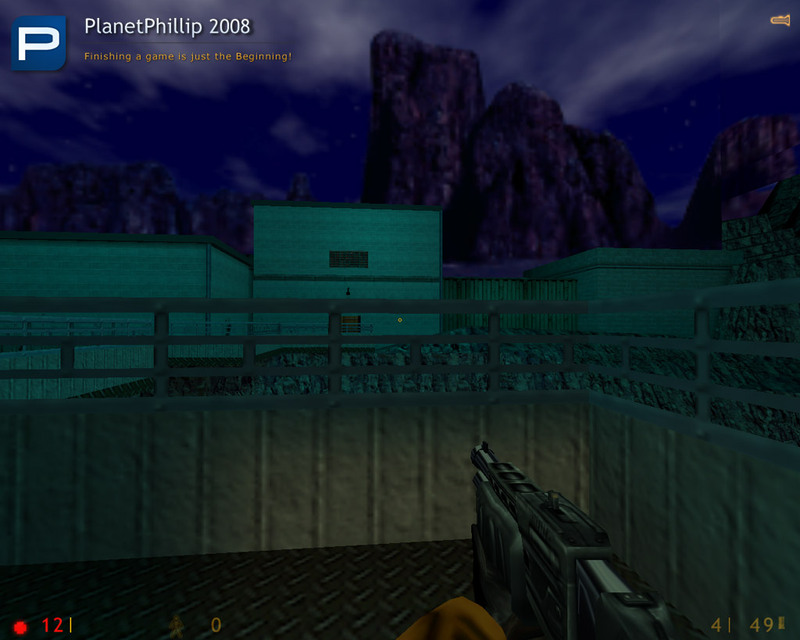 Play it if you have an obsessive need to play every Half-Life modification in existance or if you have a liking for voice acting in modifications. Otherwise, you really should be playing Heart Of Evil. AI, the machine gun isn’t inactive. It’s just a little temperamental, unfortunately. Basically, you have to step back a couple of paces before you can use it. 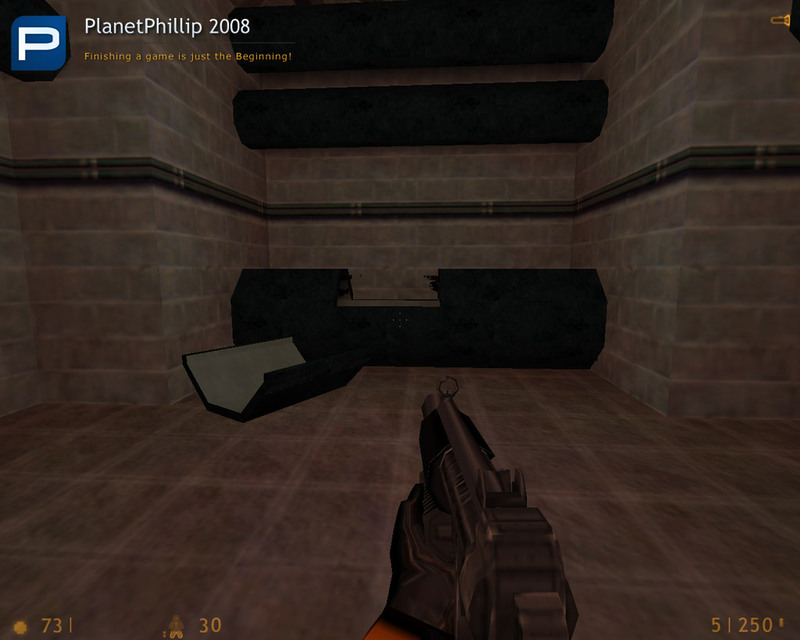 It was the same with some of the machine guns in Half-Life. I’m certain some of them didn’t work every time you pressed use right behind them. Not that I’m trying to make excuses or anything. Actually I’ve been re-doing the map today a little, and have figured out a way to make it operate easier. I think I’m going to release a “minor update” version in a week with improvements based on what people have said. Philip, you give a good suggestion about the barnacles. With the minor update I’m planning, I might see if I can get a voice actor to say that “”****, the elevator is broken! There’s a switch at the next floor that would raise it automatcially. mmm I wonder how we could get up there?””, and then add it in. That’d only take a couple of minutes to add. And quite a few people have commented on it. I mean, not that people are really negative because I think people do like the puzzles, but you’re right, it would be better if there were better hints. With the jump from the ladder to the detonator, that’s fair enough. I thought it might be annoying, but none of the playtesters mentioned it so I left it. That said I’ll look into making it easier. Should be pretty easy to fix. 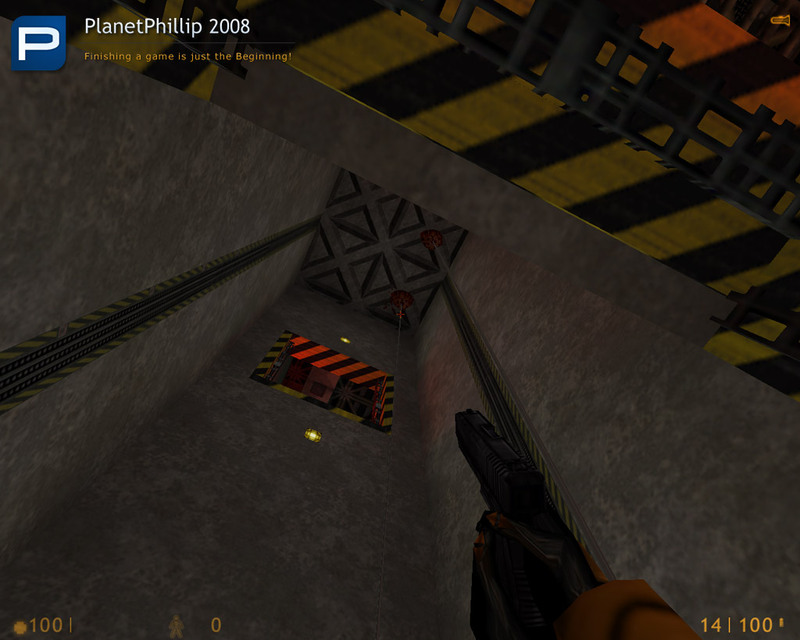 BTW also I don’t believe quick-saving makes for good gameplay myself, when I played HL1 I tried to do it only using the autosaves so I want people to be able to do my episode the same way and not be frustrated. Finally, the door after the Osprey doesn’t get destroyed, Barney opens it after seeing the Osprey come down, and then it closes automatically after you go through. Anyway thanks for the feedback. I think I’ll just keep checking people’s comments for the next week and then release a final mini-update sunday or so. My apologies, I just assumed that. When the Osprey crashed the door was gone. Sorry. 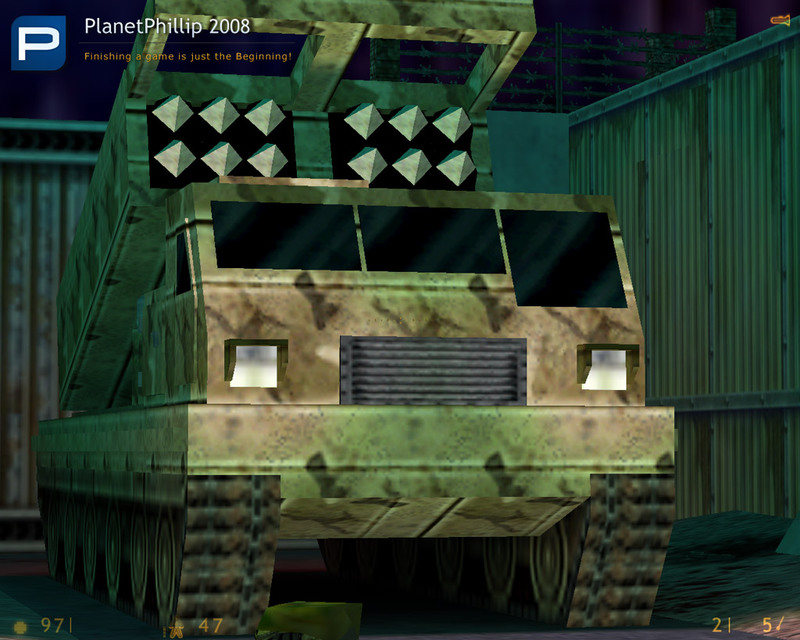 I’ve added some more images, that takes the player to the end of the mod. Ben, sorry to be always complaining but…. 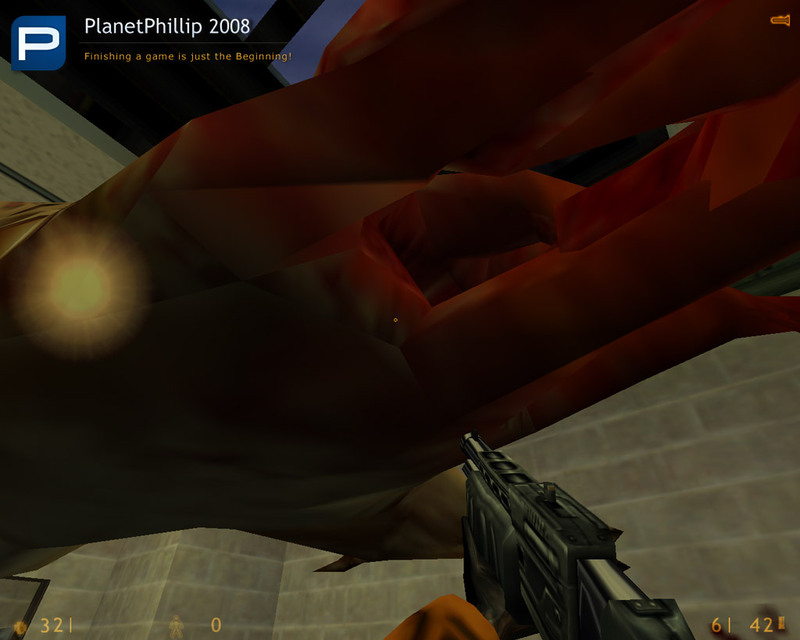 Image 16 show what happens if the player moves back just as the bullsquid falls through the ceiling. It’s possible to let him land on you and kill him without him inflicting any damage. I thought you’d like to know. Fluffy, thanks for your comments. The only thing I disagree with is about the script being badly written- I mean, you don’t like it, and that’s fair enough, but that doesn’t mean you can objectively say it’s bad. About the mod being for an old game, yeah that’s a fair point. I only really finished the mod off because I started it ages ago, took and a break from it and just thought iit seemed silly not to finish it off and release it. As for the voices, they’re just supposed to be like the original ones. I thought that would make it seem more authentic to the original game. Personally I think the Barney voice in particular is unbelievably good (I didn’t do it myself so that’s not me showing off), but that’s just me. Anyway dude, I appreciate your comments because you backed everything up with arguments, and gave the episode a fair crack. BTW I’m glad you enjoyed the puzzles, and thanks for calling them creative. They’re what I’m most proud of in the mod. 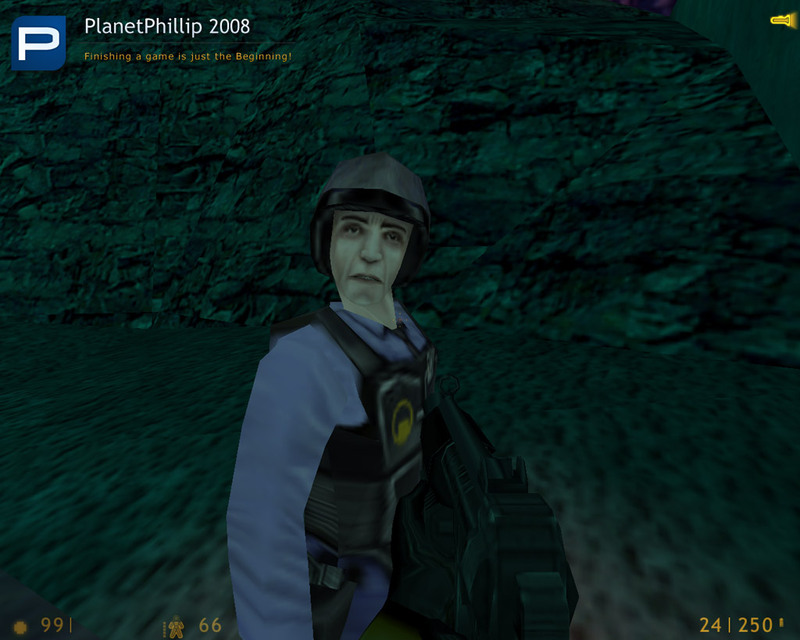 I really wanted to avoid the usual grunt-fest style thing we often see with HL1 mods. Philip, thanks for the info about the screw-ups, I appreciate it. I’ll easily fix that Bullsquid problem. I disliked the script because, as I said, it conforms to odd stereotyping. Lines like “Let us leave Officer * to his beverages, shall we?” and “The concurred-apon plan…” made me burst out laughing in sheer disbelief. Don’t get me wrong, the voices themselves are very well-done, it’s just the dialogue they had to say that I disliked. 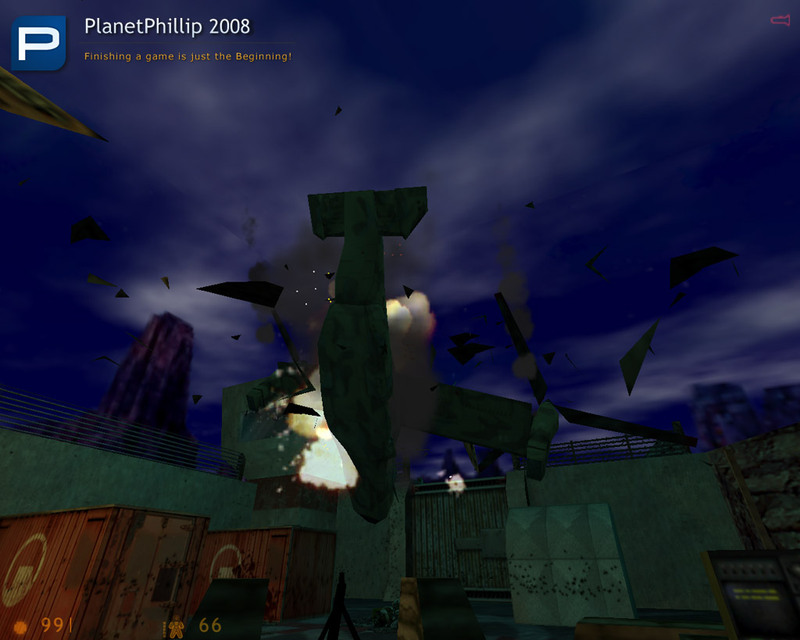 The beginning segment was a joke, I have no problem with playing new Half-Life 1 modifications. I rather prefer them since they’re quicker to download and often quicker to play, thus allowing me more time of the day to spend on multiple hour S.T.A.L.K.E.R binges. And well, Fluffy, I think that’s harsh criticism to say you burst out laughing in disbelief, or to describe something as “a joke” but thanks for the feedback all the same. Ben,if you had seen any of his “reviews” you would know to pay no attention to him in public.He is very critical of almost EVERY SINGLE MOD.I actually cant remember one he had anything good to say about to be honest. Edit:Just reread his post and that actually is one of his better posts.I think that may actually be a compliment lol. 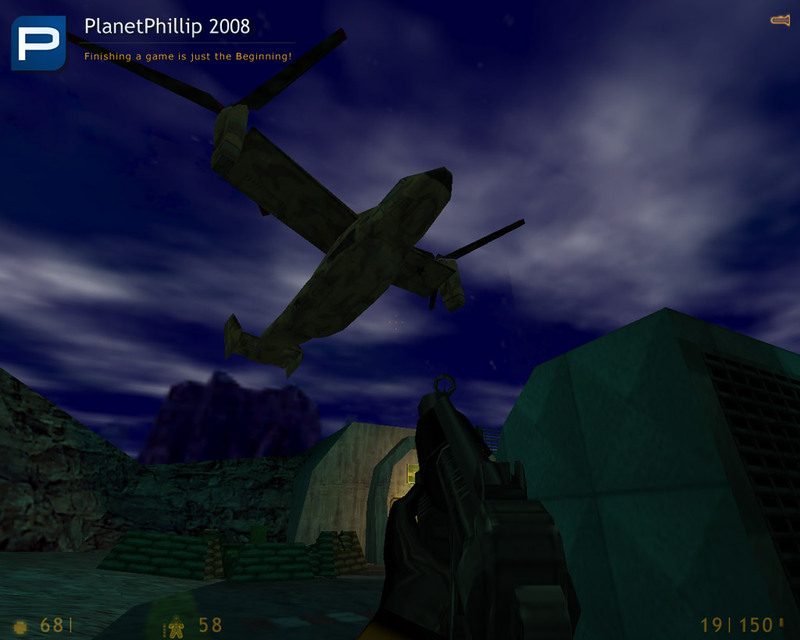 I thoroughly enjoyed this nostalgic romp in HL1 territory, though would have struggled without having found the hints file after repeated deaths in the lift that everyone else seems to have had problems with….I never figured the machine gun out but managed to down the Osprey with the weapons I had, admittedly not on my first attempt, more like 6th…. I really liked it.Nice to play something different for a change. Hi, Ben. I’ll be playing your mod tonight, hopefully. When Fluffy said “The beginning segment was a joke” he referred to his own comment (and not your mod) about how new HL1 mods still appear these days and if you would check the archive you would see that several mods were released this year and not just lost & found & added here.. I, for one, am not tired yet and even if I will get tired someday, another release will still make me happy, because it keeps the HL spirit alive as it should. And will gladly give it a play, for old time’s sake. Ah ok thanks, Ad3. Sorry about misinterpreting that, Fluffy. 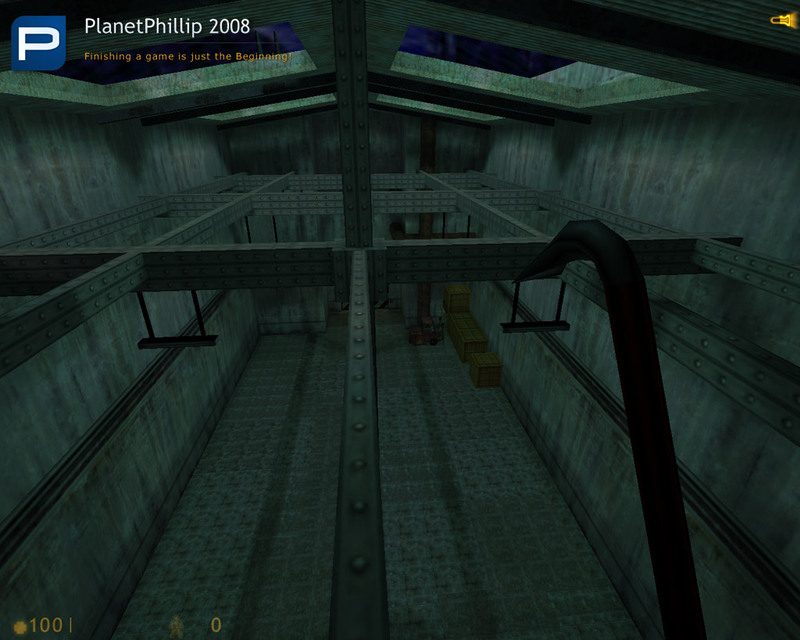 I’m surprised you can’t just play old HL1 mods with the Source engine. It’d be cool if someone made something that would let you do that. I solved the trip mine puzzle and it felt good to do it on my own. But the next one was more than a pickle. Fair enough, ad3, I think maybe there should have been more priming about shooting the glass, as Philip suggested. Glad you enjoyed the tripmine one though. And thanks for the detailed review Stef, lots of useful feedback there. Another thing, even though I’ve seen only 2 of the puzzles (I started playing it late), I must say this: they’re well thought, the ideas are great and original, BUT they’re implemented a bit wrong. 3. I usually don’t give up that easy on puzzles, but I was tired and have already read some of the comments and made an opinion about the puzzles and I apologize for that. Will continue this mod more open-minded, I promise. I’d just like to make a comment about the barnacle puzzle. It took me ages to figure it out, but that was the point — it was a *puzzle*. If Ben takes Phillip’s suggestion and signposts it any more it stops being a puzzle and becomes a task, with no thinking involved. 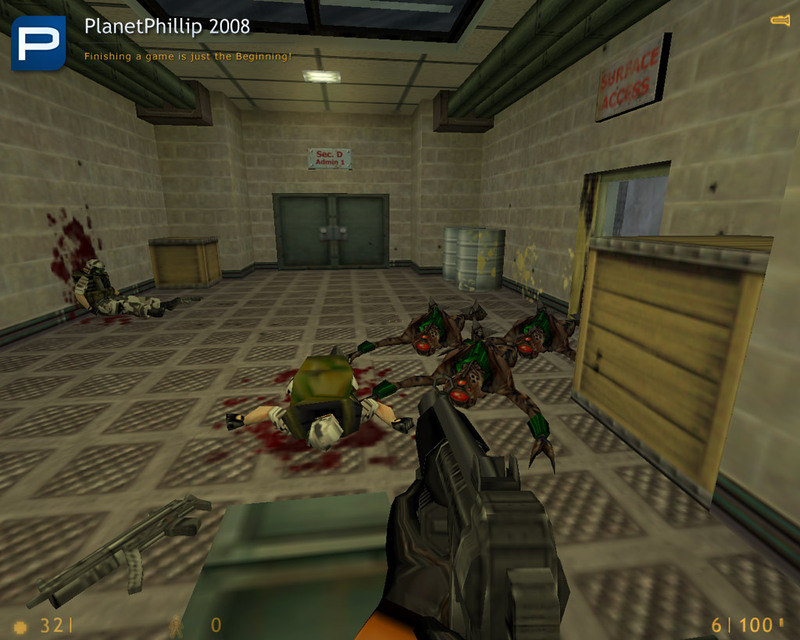 The point of the puzzles was that they’re not the normal FPS ones. I don’t think the mod should be diluted to appeal more to the brain-dead ” You Have to Burn the Rope” crowd (it’s a flash game – Google it). That’s the difference between mods and games — mods shouldn’t have to sink to the lowest common denominator. I thought Nova was a great little episode — polished, well made and great fun. It sometimes did things a little differently to HL — but that was the point. That’s what made it unique and stand out from the crowd. I did have some trouble with the jump off the broken ladder (I think I died twice) — but while all of you have yelled “that’s difficult — change it!” I said “That’s part of the game — another challenge to overcome”. 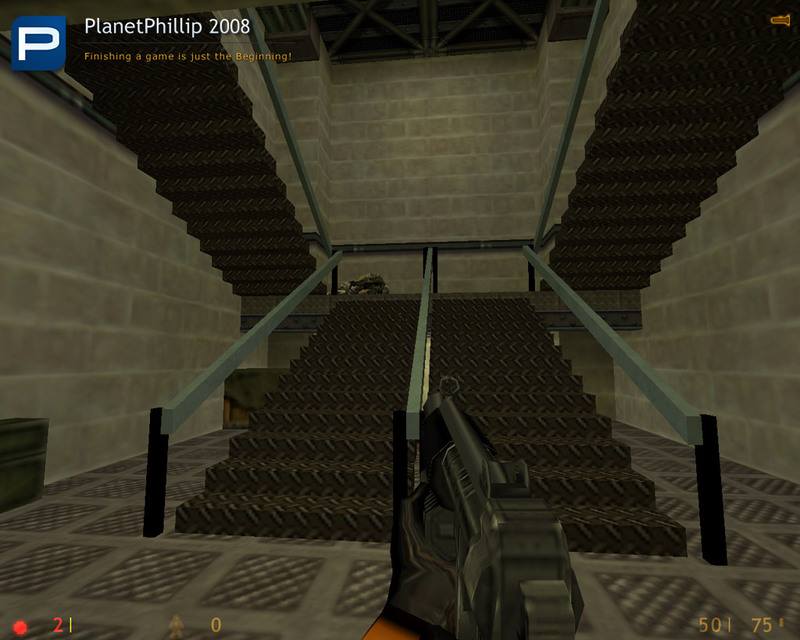 Anyone who played HL1 to the end will know it was full of difficult jumps. 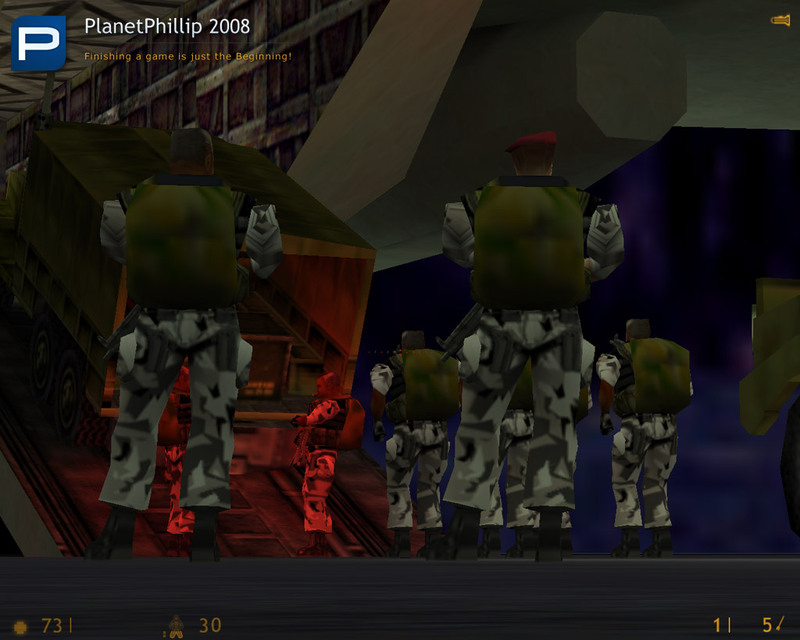 I thought the acting was fine, and the characters and script fitted in with HL1 perfectly. Now that I’ve finished it, I can finally rate it. But first, my opinions about this controversial mod, in the order of appearance. I had a bug about one scientist, too. He wouldn’t want to go further at first, but I finally managed to get him open a door for me. Some backtracking, which you don’t see every day. I liked the idea of getting hints of what to do next from the dialogues. The machine gun worked indeed if I took a step back. It’s hard to believe none of the testers complained about the broken ladder.. I saw no purpose in that, just a simple mistake of design. Game crashed when I came back to the elevator, after the detonation. The end scene was original, also. Spoiler: I liked that feeling of sneaking in the back of a truck in a setting full of grunts. End spoiler. That’s it?.. And this can and does mean 2 things: 1. I liked it and wanted more. 2. I was expecting something.. better, from what I’ve read. More immersive, spectacular, puzzling, hard and what not. The feeling throughout this mod is different and new, but only from time to time. The mapping and the fights are average. No new models or weapons. Good voice acting, but why give British accent to a scientist which has American accent when you use him? find the broken pipe and maybe a cut scene at the end would have been nice.Thanks for the great mod. It has been nearly two years since I’ve played any HLSP. However, this one looks like those old-school, decent, one-man efforts from the first years of the game. Guess I’ll re-install Half-Life soon. At the end, when you’re supposed to sneak into the military’s trucks to get away, if you’ve saved up all your ammo for the crossbow, you can snipe all of them from the manhole without getting their attention. I don’t think that’s supposed to happen. I tried and when I killed the last one the game finished and said I had failed to utilize the…..(Something something). the point I got was that you were supposed to leave them alive so they could drive you out. good fun any more on the way? I thought this one was OK. Short and mostly sweet – the only glitch being the Osprey. I could only get the gun to work by pressing my Use key when at the barrel end so could never aim it at the plane, and had to noclip through the big door. I agree that the negative comments about the dialogue are unwarranted: it’s fine both in writing and delivery. Having read all the above comments before finishing this mod I was not too sure what to expect, with lots of talk about puzzles and a few minor bugs I though; not another mod I won’t finish. I am pleased to say that I very much enjoyed this mod, in ways it was simplistic but all the better for being so. The story was well keep too with continuity via good voice acting, yes I know it was different and not what we have come to expect, but it was still good. I did not find the puzzles that difficult and would have thought all the gamers that recently slogged their way through ” The Trap” would have found them easy. OK I did need the hint sheet on the lift-shaft sequence but that was it, also I did not come across any bugs worth mentioning. 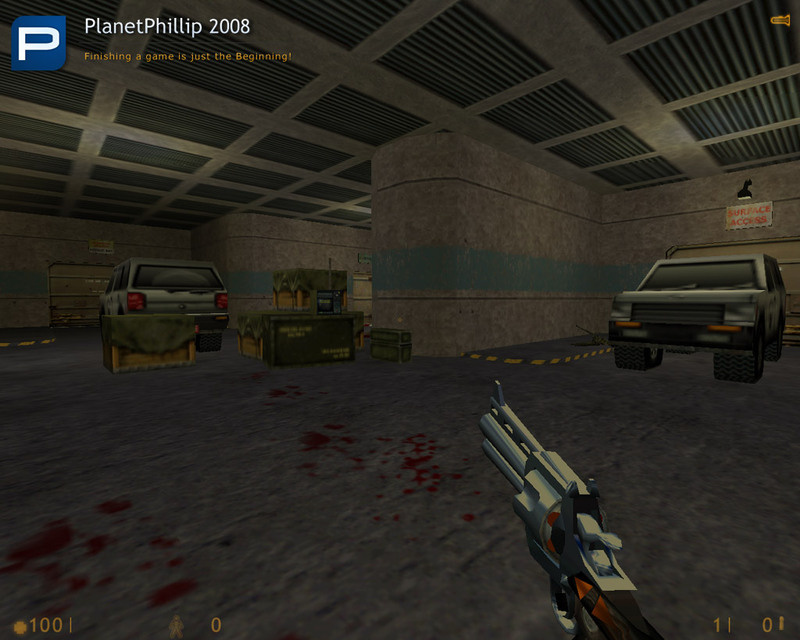 This must be the first mod/mappack I have finished in about the last 6 custom games hl2/hl1. I have got feed up lately with the number of mods that were too bugger, too puzzle orientated or just not interesting enough to bother finishing. This game for me was fun, complete, story driven with a fine balance between combat, puzzle solving and climbing about. I personally don’t think the author should spend any more time on this mod its ok has it stand, much sooner see you spend the time on giving us a new mod, I am sure it would be great. GOOD mode! I want continue! Too clever by half in that it’s often painfully difficult without being very interesting. 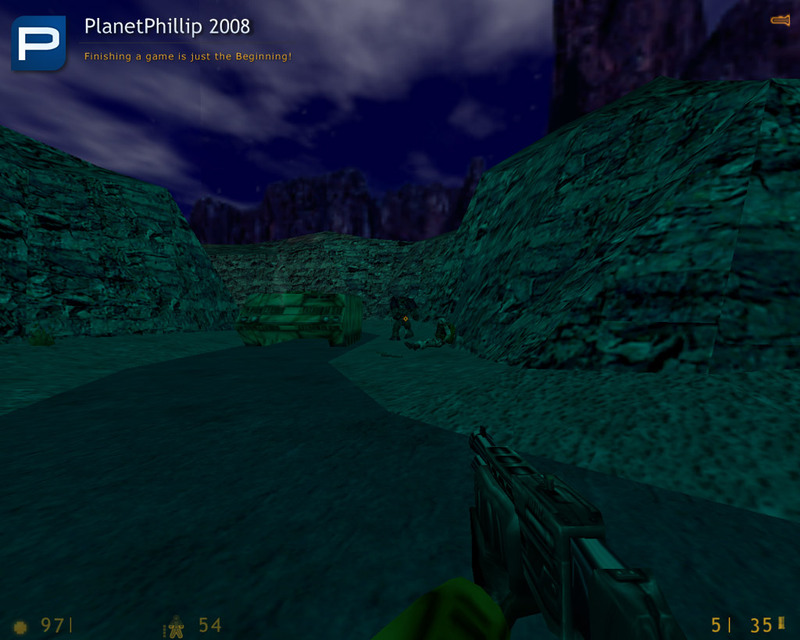 Uses infinite marine spawning in one location as a substitute for creative mapping and gameplay. Several of the puzzles are so arcane a hint.txt was needed. I didn’t enjoy this mod. Spoiler alert….I really enjoyed this mod up until the end and I hit a wall. In the room with the pipe, I pushed the detonator, and I can see the crack in the big pipe, but nothing, absolutely nothing will break open that pipe, not the crowbar, nor any amount of shooting in a hundred different patterns. So disappointing to not be able to finish it. Any advice? BTW, I had no trouble bringing the osprey down. You have to time it right so you run out when the osprey disappears from sight to the upper left. Then grab the machine gun from about 2 steps behind. Shoot patiently as it circles at the rotors. There will be no spawning unless you shoot at or kill the soldiers on the ground before you bring the osprey down. I got two problems when playing – blowing up osprey and missle launcher. After all I solved both of these problems with my handgun 🙂 . And shotgun help me with that “elevator-and-barnacle” puzzle. Very good episode – fun, dynamic and original. Minor flaws do not spoil the overall good impression. These military settings are exactly what I like most in HL and altho you can shoot down an Osprey and an Apache in here, it confused me somehow.